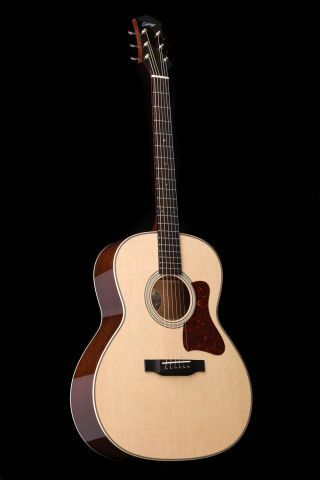 Models offer "power and volume of a full-bodied acoustic in parlor proportions." Collings has unveiled its new C100 line of parlor acoustic guitars. According to the company, the new series of models will offer the power and volume of a full-bodied acoustic in parlor proportions. The guitars' near-16” lower bout and 4 3/4” body depth is behind the bigger sound, but the models' narrow waist and non-scalloped bracing design aim to deliver the balance and clarity of smaller-bodied acoustics. The C100 line will feature three models: the C100, with mahogany back and sides, rope purfling and an unbound neck; the C100 Deluxe, with an East Indian rosewood back and sides and an ivoroid-bound fingerboard and peghead; and the C100 Deluxe SB, with a Sitka spruce top and sunburst finish. Prices for the C100 models have not yet been made available, but if we had to take a guess, you'll probably have to dig deep into your piggy bank for these. For more info on the guitars, head on over to collingsguitars.com.